Genre: Fiction, fractured fairy tale, romance, fantasy, good adult fractured fairy tales are hard to find but I got one right here! Summary: Rapunzel is the fairest in the land. So much so that the girl with the magically long hair is able to catch the attention of Prince Josef for one amazing night. Unfortunately, he is promised to another in order to soothe his kingdom which is on the brink of war. Disheartened by her lost love, Rapunzel later hears whispers of the King and Queen’s beautiful daughter Snow White and how beloved she is by all. When the Queen dies under mysterious circumstances, the King remembers the beautiful Rapunzel and makes her his Queen. Will Snow White become the child she always longed for or will fate choose a more sinister course? Beware, this is not your typical Disney-fied fairy tale. 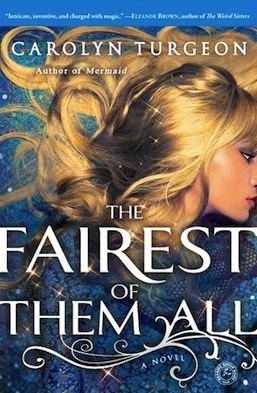 Fractured fairy tales are a dime a dozen, and I have read my fair share of amazing and terrible takes on the genre, but Fairest of Them All stands far above the offerings I’ve imbibed. Not only does it combine the original tales of Rapunzel and Snow White, but it also does so in a very original and adult way, fully fleshing out the story in remarkable ways. See Hollywood, you don’t need to set things in space to make them original! Sorry Cinder, you know I still love you. Note: this novel should not be confused with the Snow White retelling Fairest of All: A Tale of the Wicked Queen from comic book turned prose novelist Serena Valentino based on the Disney film. However, if you’re looking for something adult and in the same vein, you should definitely check out Neil Gaiman’s haunting short story with a similar theme: Snow Glass Apples. Just don’t expect a happy ending. For anyone who doesn’t know how the original fairy tales go, here’s a brief summary. In the Rapunzel fairy tale, a husband and wife live next to the garden of a witch and for some reason the pregnant wife will not eat anything but the rapunzel plant that grows in her garden. On the third night of thieving the plant, the husband is caught and the witch, Dame Gothel agrees to forgive him if he gives her their then unborn child. Since parents in fairy tales are the worst, he readily agrees. Gothel raises the girl with the long blonde hair (whom she names Rapunzel) as her own and locks her in a tower when she comes of age just because. After being drawn by her beautiful singing, a Prince happens upon and uses her super long super strong hair to climb into her room in the tower. There they devise a plan to run away and get married. Like you do. Unfortunately, this is the Brother’s Grimm version and Gothel learning of the pair’s deceit through a foolish Rapunzel banishes her adopted daughter to the wilderness. But not before she chops off Rapunzel’s hair and uses it to trick the Prince into visiting one final time. Once in her clutches, the witch tells the Prince he will never see Rapunzel again and he throws himself off the tower and lands on some thorns which blind him. But somehow doesn’t damage any other parts of his body. He spends his time wanderIng around blind until he once again hears Rapunzel’s singing and finds his love who has given birth to their twins (a boy and a girl). Reunited, Rapunzel’s tears heal the Prince’s sight and he takes them to live happily ever after in his kingdom. Apparently the witch gets off scot-free except in that one version which decided to have a moral about being evil. In Fairest, Mathena Gothel tells Rapunzel and her magical hair (which can feel other people’s secrets) the tale of how she came to be in her care (the same as in the original) and she spends Rapunzel’s childhood teaching her how to be a healer. However she never allows her to use the word witch in fear of the kingdom’s recently reformed policy against magic and the fear it strikes in the hearts of the citizens. JUST LIKE THIS. She specifically teaches Rapunzel how to perform various spells of the heart as those same citizens who speak out about witchcraft in the presence of royalty have no qualms about having a witch help them with their man troubles. Rapunzel finds these customers weak and foolish until her heart falls for the handsome Prince Josef. Seeking to protect her adopted daughter from the Prince who is merely lusting after her, and from her past troubles at court, Mathena, knowing he is betrothed to someone from a neighboring kingdom for peace treaty reasons locks her in the tower. But much like life, their hormones find a way. After their night of pleasure, Josef goes back to his kingdom and marries his intended and they give the kingdom an acceptable female heir: Snow White. Although it would have been preferable if she had been born Steve White. The Grimm’s version of Snow White is much more well known. A Queen gives birth to a daughter with skin as white as snow, hair as black as night (or a picture frame) and lips as red as blood after wishing it so. Too bad she dies soon after. A year later, the King remarries a beautiful yet wicked woman who is so obsessed with her own beauty that every morning she checks with a magic mirror to make sure she’s the fairest one of them all. When Snow White turns seven the mirror changes its tune, telling the Queen that Snow White is a thousand times more fair than her. In jealousy (way to go mirror) the Queen instructs her Hunstman to take Snow White into the woods and kill her, requesting he bring back her liver and lungs to prove he did his job. Instead of killing her, he releases her into the woods where she is taken in by seven dwarfs. You know, after she breaks into their home and prays upon their sympathy with her sob story. The Queen learning Snow isn’t dead goes to finish the job herself, eventually incapacitating her with a poison apple. The piece of fruit lodged in her throat convinces the dwarfs that she’s dead and they put her in a glass coffin. Because that would be your first response, right? As if this isn’t bad enough, they then give the coffin to a Prince who falls in love with her beauty. As they’re traveling, the men carrying the coffin trip and the apple dislodges from Snow White’s throat and she lives once more. Even though the Prince is totally into necrophilia, Snow White marries him. Hearing from her mirror that a Young Queen is more beautiful than her the Wicked Queen goes to check out this women, not knowing it’s Snow White. Once at their wedding, Snow White’s stepmother is forced to dance in heated iron shoes until she dies. Yay medieval torture, so much for a fair and just trial. In Turgeon’s version, seven years later when Rapunzel arrives in the kingdom after the death of Josef’s first wife, she is anything but evil. In fact, Rapunzel truly wants to do what’s best for Snow White and tries to help fill the hole left by her deceased mother, even taking her to visit and help heal the woes of the peasants. Albeit through witchcraft. Or in this case herbology. You can’t help but feel bad for Rapunzel who is not necessarily a bad person (she’s more in a grey area) but due to circumstances and her own upbringing isn’t truly and wholly as good as you expect your storyteller to be. Rapunzel also befriends a Falconer named Gilles who takes the role of the Huntsman. Unable to produce an heir and the hated Queen of the kingdom, Rapunzel becomes jealous and full of hate for everything Snow White represents. Her own failure to produce a viable child, her own beauty that once enraptured her husband and the approval of the people. Again, all a magical mirror’s fault for telling her Snow White is way prettier. At her breaking point, Rapunzel demands Gilles kill Snow White and give her her heart, so she can eat and imbibe her power and beauty. Not that she doesn’t feel guilty, she does, and worries about possible punishments which include, yes, iron shoes. It’s after this point that things take a dark and twisted turn in the story. See also: Snow White’s story in 1001 Nights of Snowfall. You may see some of it coming, but I guarantee you will not see all of it coming. Carolyn Turgeon took a well known story, added layer upon layer of depth and then turned the whole thing on its head. Mind. Blown. Now if you need me, I’ll be reading Carolyn Turgeon’s two other fractured fairy tales, Mermaid: A Twist on the Classic Tale and Godmother: The Secret Cinderella Story.